The Quetzals (/kɛtsˈɑːl/ or /ˈkɛtsəl/) are vibrantly colored birds and considered among the world’s beautiful. These striking colored birds live in mountainous, tropical forest of Central America, with five species from the genera Pharomachrus and Euptilotis. The Euptilotis species is nearly restricted to western Mexico and northwest region of Guatemala, most notably in Baja Verapaz area. These birds eat fruits, insects, lizards and other small creatures. Quetzals have glistening feathers mainly, green, blue and red. However, the colors of male Quetzals are more vibrant. Even though these birds have vivid plumes, it is astonishingly hard to see them in their natural habitat. Also, male quetzals have twin tail feathers that form an amazing train up to three feet (one meter) long which grows during mating season and this train is absent in female quetzal. A Quetzal pair uses their strong beaks to hollow hole nest in rotted trees. Inside, they will alternately incubate two to three eggs and because male quetzal has longer tail that it sometimes stick outside the nest. After three weeks, a young quetzal can fly, but it will take three years for male Quetzals to grow their long tail plumes. Aptly named bird as Resplendent Quetzal or also known as the Guatemalan Quetzal, the famous long-tailed quetzal of Central America. It is also the national bird of Guatemala and trades in currency of the country referred as “quetzal”. The bird was also sacred to the ancient Mayans and Aztec people. 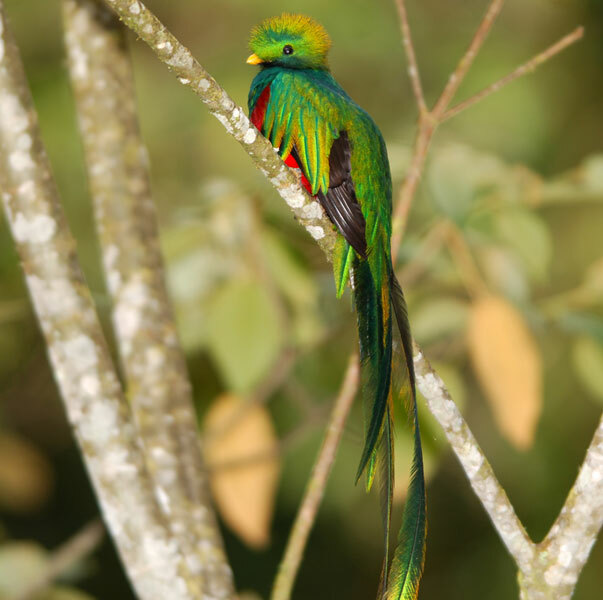 Though none of the quetzal species are under immediate threat in wild, however, the Resplendent Quetzal is in near threatened status. Often held in captivity or killed, their main threat is the disappearance of their wooded habitats. The Quetzal Bird is one of Guatemala’s ecological treasures. If you enjoyed the bits of information on Quetzal bird, and wants to read more from The Mixed Culture, make sure to subscribe to my mailing list to get my latest blog straight from your inbox. Or, follow me on Facebook or Instagram for the latest scoop from The Mixed Culture. Feel free to email me for any questions or comment below. It’s really a beautiful bird. I would like to see one ! Next Next post: Sing her a song…do a Harana!